How do you make the 641 horsepower McLaren 650S, a car even faster than the McLaren F1 in some metrics, even better? Opening the top up on a nice day is a good start. 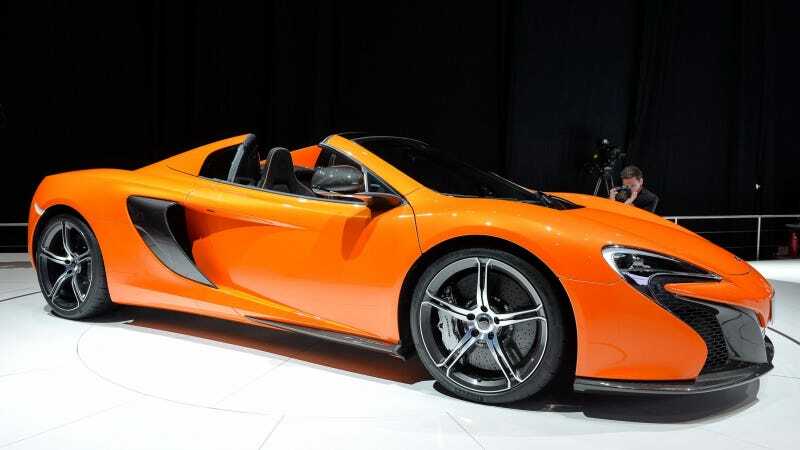 This is the McLaren 650S Spider. Today at the Geneva Motor Show, McLaren lifted the roof on the hardtop convertible version of the new Ferrari-slayer that slots in between the MP4-12C and the hybrid hypercar P1. I think it looks pretty good in Spider form. More importantly, it's just as potent a performer as its fixed-roof brother. Zero to 60 mph in three seconds flat, zero to 124 mph (200 km/h) in 8.6 seconds, and a top speed of 204 mph. The retractable hard top is quick too, going down in just 17 seconds. McLaren also says the car's carbon fiber chassis requires no additional strengthening or reinforcing for the convertible version, and though it does get a slight weight increase of 88 pounds, it's still lighter than any cars in its class. I hope the weather is sunny in Geneva today and someone over there has plans to enjoy this thing.